This Kia Ceed is available in Silver, Black, White, Red, Blue other colours and lease options, subject to availability and includes a warranty. An excellent proposition, bolstered by the exceptional long term warranty – Good quality build and materials, with plenty of space for passengers and luggage. The ride is pretty comfortable and you get a seven-year warranty. Which KIA Ceed are you going to lease today? We offer top quality Kia Ceed from brand new, nearly new, slightly used or ex demo, whether you have good or poor credit rating, pay a low or no deposit. These Kia Ceed can be leased or financed and come with a warranty, HPI checked and when contract hire leasing, include UK nationwide delivery and AA or RAC Roadside Assistance cover for peace of mind. Time4Leasing can offer you the latest Kia Ceed lease deals at lower prices because these vehicles are exclusive and offered at lower rates to customers that have good, poor or even bad credit history score ratings. So far, we’ve only tried two of the engines available in the Kia Cee'd. The 126bhp 1.6 diesel is the better of the pair - it pulls strongly, revs sweetly and is relaxed at motorway speeds. The 133bhp 1.6 petrol doesn’t feel nearly as punchy as its 9.9sec 0-62mph sprint time would suggest. There’s a wide range of trims available, so you can spec your car to be basic and cheap or fully tooled-up, with various degrees in between. Whichever model you go for, though, you’ll get air-con, front electric windows, central locking, an iPod-compatible CD stereo and Bluetooth connectivity at the very least. Another quick word to the wise. Some of the early cars will come on Hankook tyres and some will come on Continentals depending on trim and wheel size. Experience tells us that the Contis are much better for grip, compliancy and noise. Before your order, make sure you ask your dealer which tyres your chosen variant will come on, and arrange to get them changed if necessary. 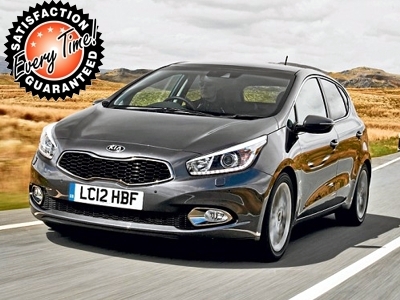 There are 58 Kia Ceed Lease Deals on Offer.